We received the following opinion piece from New Yorker Stelios Taketzis about the planned demonstration for the Macedonian issue that is scheduled to take place on March 18 in New York City. Following the large demonstrations for the Macedonian issue in Thessaloniki and Athens, the action moves state side. According to reports, there will be a demonstration on March 18th in front of the United Nations. I personally feel that this demonstration is rather time deferred. It is one that should have taken place 14 years ago on November 5th, 2004. Why on November 5th, 2004? 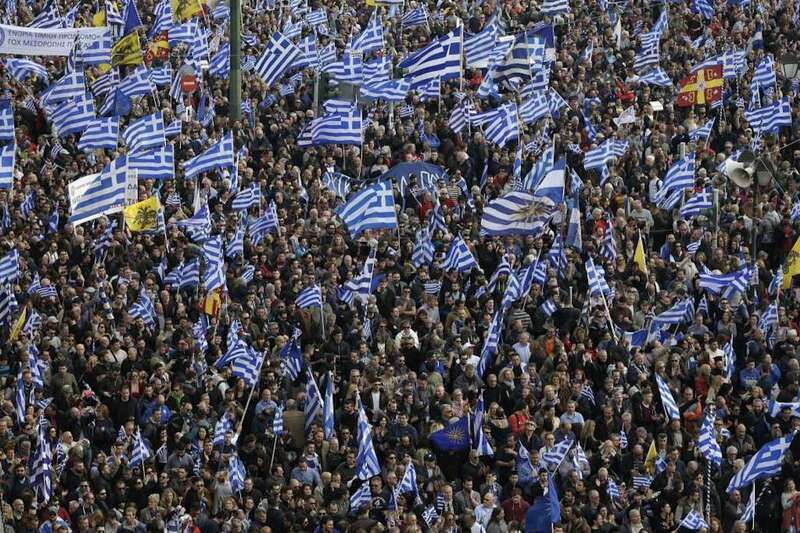 I will never forget that day, a very significant day for Greece and the Macedonian issue. You see until that day the ‘game’ was a draw. Despite the recognition by many other nations we still had hope, but on November 4th, 2004 we were dealt a significant blow. Here in the United States, in our country, home to thousands of Americans of Greek heritage, home to many millionaires and billionaires with political clout, with a lobby, with the Archdiocese, with federations and Pan-Macedonians, yes, here on our turf, we realized a bitter loss. And although one would expect the next day, the day of November 5th, 2004, we would move heaven and earth, Washington DC would become blue from the demonstrators’ flags, and the sun would hide behind the smoke from the countless American passports that frustrated Greek-Americans would burn, and all the news agencies and television channels would fill with the voices of protest… nothing happened. There were some lukewarm protests and letters, and then silence. And now 14 years later we are invited to shout in front of the United Nations the well-known slogans “Macedonia is Greek,” “Alexander the Great was Greek,” etc… with the hope that those in charge in Greece will listen and change course. Except, as we know, Megaro Maximou (the Greek Prime Minister’s office,) is an ocean away while the White House and the Capitol are a few miles down the road. Whoever thinks that the United States has no part in the Skopje issue is grossly mistaken. And perhaps, the organizations in the United States that are organizing these protests against the Greek government should try to figure out how to influence the American decision making institutions. You see, on November 4th, 2004, we suffered a terrible loss, but it is not the saddest day for the Skopje issue. The saddest day is November 5th, 2004 as this was the day, after this painful slap by the American government, that we should have regrouped, collected our thoughts, and formed a most strategic approach to influence the American policy centers. My friends, protests and slogans may be good for emotional release, but for serious results we need hard work. International politics are complex, multi-dimensional, and inter-connected matters. Many feel that the mere use of slogans simplifies the situation and does not help solve the issues. The United States has many vital interests in the Balkans, and they will enforce them by all means at their disposal, and they have many. The game intensifies. In the international politics chess game, many pieces will move; this is why extreme care is needed, care and strategy. And, as, in a few days, we will shout “Macedonia is Greek,” we must also remember that Macedonia is and will always be Greek. Macedonia is not in danger. But right next door to Macedonia is Thrace, and a bit lower are the islands of the Eastern Aegean. This is serious food for thought. Editor’s Note: The Pappas Post welcomes opinions from our readers on matters pertinent to our audience. The articles published as opinions by our readers are not necessarily the opinions expressed by The Pappas Post. It is not just the US that has become anti-Greek. When will Greeks wake up that their is massive racism against Greeks around the globe. They ALL know SKopians aren’t Macedonians. Its a subtle form of ethnic harassment. Until Greeks stop burying their heads in the sand and calling out this bigotry head on the root issue will never be addressed.